First, a quote (or paraphrase) from Confucius: “I show a dull man one corner of a room, and he sits in the corner grinning. I show a wise man one corner of a room, and he shows me the other corners, plus the entire house.” There are quite a number of people grinning in the corner, based on some of the comments made at WUWT, which started this entire post. Some low-information commenters on Anthony Watts excellent blog made light (jeered, even) at my suggestion that the recently-announced MIT storage spheres will solve the intermittency problem of wind-energy. A few, however, asked polite and intelligent questions. This is my response to those polite folks. Now, as to the basics of how PSH (pumped storage hydroelectric) works, and then how the MIT spheres work. There are numerous PSH sites in the US (more than 22,000 MW at last count by EIA – Energy Information Agency). 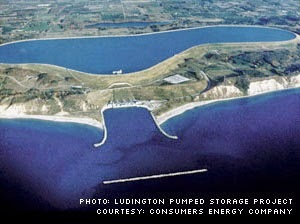 One of the largest sites is on the eastern shore of Lake Michigan, the Ludington Plant. Like all PSH plants, there is an upper reservoir and a lower reservoir. The lower reservoir is Lake Michigan. The upper reservoir is man-made, about 360 feet above the lake, and on a sandy cliff-like edge of the lake. At night, six turbine/pumps run in pump mode by drawing power from the grid to pump water from Lake Michigan into the upper lake. The next day, the flow is reversed so that water flows from the upper lake through the turbine/pumps into Lake Michigan, this time generating power as needed. The upper reservoir and land occupy 1,000 acres. The generators produce 1,872 MW of power at maximum flow. The penstocks (six of them) or pipes, are 1,300 feet long and 28 feet diameter. These connect the upper and lower reservoirs. The plant was built between 1969 and 1973. As PSH plants go, it is large but has a low elevation change. In contrast, the Castaic PSH in Southern California, near Los Angeles, has an elevation change of 1,060 feet and produces 1,247 MW for up to 10 hours in generating mode. Castaic PSH also draws power from the grid at night to pump water uphill from Castaic Lake into Pyramid Lake, the upper reservoir. The tunnel connecting the two lakes is 7.2 miles long and is 30 feet in diameter. Castaic PSH has six pump/turbines and one standard turbine generator. Because the elevation difference is greater, Castaic has much lower water flow than does Ludington. These two examples show a low-head and a high-head PSH plant (Ludington is low-head, and Castaic is high-head). In this context, head is the elevation difference in feet between the upper and lower reservoirs. During the day, when peak power is required, seawater is allowed to flow by natural pressure from the ocean through the turbine/pump into the sphere, turning the generator and producing power to the grid. Water flowing in forces air out of the sphere through the vent line into the atmosphere. With proper design, about 80 MW will be produced into the grid for each 100 MW consumed from the grid. As to the servicing and maintenance issues someone asked about, this is trivial. Proper design will have the entire turbine/pump and generator/motor equipment in the atmospheric pressure zone above the sphere. Simply put, that building will also be vented to the atmosphere. Likely, an elevator will convey workers and materials to the submerged sphere, much like in a mine shaft on land. There is no need to contemplate high-pressure underwater activities. Purists will say, at this point, yes but what about screens to keep fish and other marine life out of the turbines? Those screens or similar devices may require periodic cleaning, but that can be done remotely with ROVs. (remote operated vehicles, think unmanned submarines). As to the MIT paper indicating 6 hours of storage, and the naysayers objecting that this is far too little. It should be pointed out that Castaic PSH has only 10 hours of generating capacity, and about 11 hours for Ludington. However, these spheres would be storing offshore wind-energy and could require operation for several days. There are three salient points about PSH generating time: one need only change the generating time by 1) increasing the diameter, 2) adding more spheres, or 3) increasing the head. Put simply, if the sphere volume is the same and only one sphere is used, one can obtain double the generating time by setting the sphere twice as deep into the water – this increases the head. Similarly, if one maintains the head constant, one can obtain 8 times the generating time by doubling the sphere’s radius. Or, one could maintain the head constant and add more spheres of constant radius to obtain the increased generating time. Note that it is not required to have a turbine/pump with motor/generator on each sphere. The spheres can be connected one to another by suitable high-pressure pipes. Very likely, the most economic choice for increased generating time is simply to increase the spheres’ size. Spheres have a nice property for that, as materials required go up with the square of the radius, but volume increases with the cube of the radius. One may also excavate out a hollow in the ocean floor and set the larger sphere in place, if water depth is an issue with a larger sphere. Now, as to the testing and prototyping as asked about: yes, the MIT publications state the system has been built, has been tested, and measurements taken on an actual sphere. The economics are much criticized in the comments on WUWT. It was overlooked, apparently, by the naysayers that MIT stated the cost per sphere will decrease as more are deployed. This is the economy of mass production. Henry Ford recognized this with automobiles; it still applies today. Another cost-reduction will occur as spheres are made larger, this is the economy of scale for unit production. Yet another cost reduction will occur as spheres are installed along trunk power lines laid on the ocean floor. It will not be necessary to build the electrical infrastructure again for each sphere. Another word about economics: with a suitable number of spheres in place, there will be no need for land-based fossil-fuel power plants to be built in excessive numbers. Instead of the 1,000 GW currently installed, the US could have only 600 GW installed, and let the spheres do the peak load work. The savings from not installing 400 GW of on-shore fossil-fuel power is indeed large. That will offset much of the cost of installing the spheres. As to the land-locked cities, spheres can be installed in the larger Great Lakes, with a power grid designed to send power from wind-farms in the Great Plains to those storage systems, then back out the next day. Even shallow Lake Erie can have storage spheres, they would simply be buried in a suitable hole in the lake bottom. This wraps up the MIT sphere grid-scale storage technology. It works. It has zero energy cost. It has very low environmental impact. It can be constructed now, without waiting for offshore wind-turbines. It reduces the cost of on-shore generating plants – fewer plants will be required. Power from the spheres is almost instantaneous and can be at full power in less than 30 minutes. It quite easily follows the load. Economy of scale and mass production will decrease the costs. There is a huge coastline with shallow continental shelf along most of the Eastern seaboard and Gulf of Mexico, so placing numerous spheres is quite possible. It makes intermittent wind energy very reliable, available on demand.